Recently I used PowerShell script to ensure duplicate detection rules are always published after release. This script uses “Microsoft.Xrm.Data.Powershell” module. Duplicate detection rule name is passed as an argument, and this script will publish it if it was not. I love Dynamics 365 users group Melbourne, Nadeeja Bomiriya (MVP), Elaiza Benitez (MVP) and Daniel Hesketh are doing great community contribution. Later a couple of people asked if I can export and share Flows, so here I m sharing the link to my slides and exported Flows. 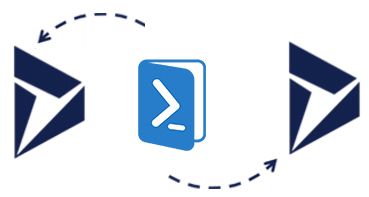 Powershell scripts are used with data centres, clouds, virtual machines, servers and applications to perform a variety of administration tasks, and Dynamics 365 is not an exception. The following script can be used to export a solution from one environment and import into other. It works with managed, unmanaged, and patch solutions. Execution of script can be triggered manually or it can be put into release pipeline. This script uses Microsoft.Xrm.Data.Powershell (it is a great module to work with Dynamics 365 implemented by Sean McNellis and Kenichiro Nakamura). The script will attempt to install the module in case it is missing. Don’t forget to update CRM credentials, URLs and solution name in code. Today I was doing a Flow task and to complete it I used variable as a flag. It is very interesting Flow is a “No Code” approach but still many coding concepts are available in it. Having development experience or knowledge just open another door of creativity. The good thing is in Flow “No Code” means we don’t write code, rather we use code blocks as actions to do different things. We don’t have the flexibility of custom code but available code features are very useful. Here is a little description of these actions. Using “Initialize variable” we can declare a variable, specify its type and initial value which can be dynamic or hard coded. At the time supported types are Boolean, Integer, Float, String, Object, and Array. Set variable assigns a value to an existing variable. Increment and decrement actions work with numeric types only. You can specify a number and variable value will be increased by that number. Append (array and string) actions add new value at the end of existing variable values and are often used in iterations. Plugin registration tool (v.9) was working fine but I had to change the user account to deploy a plugin and tool started crashing. It was accepting my password, showing available CRM instances, and after I select the instance, without reporting any error it was crashing. I hope this quick tip is helpful. We can easily create or modify a view in Dynamics 365, this basically generates and saves view FetchXML. It is a great feature but we don’t have control to modify FetchXML. The good news is it can be done without writing code. “View Designer” is another useful XrmToolBox plugin which allows editing of view FetchXML, save and publish it back. I hope this quick tip was helpful. Enjoy your day of 365 life. For complete details of System Job types see “OperationType” attribute in “AsyncOperation” (System Job) entity. Why we need to monitor System Jobs? It is quite common to use asynchronous workflow, asynchronous plugin, rollup field, bulk delete or import features. Since they are asynchronous, most of the time we will not get a notification if they fail until we go and check status. We can navigate and see status when we need. It is useful but sort of manual. It will be good to have a piece of automation which may periodically inform power user or admin about failed jobs. In this demo I will use Flow to send a scheduled email (once a day in this demo but of course it can be configured as per requirement), listing the status of failed jobs. This approach can be used in different scenarios. From “Show advanced options”, select time zone and start time. I m using “(UTC + 10:00) Canberra, Melbourne, Sydney” as time zone and “2018-06-08T10:15:00Z” as the start time. Wait for execution as per time entered or from top right corner click “Test” for testing execution. Using Flow for monitoring can be used in interesting scenarios like scheduled monitoring, monitoring a particular async resource or type of resources and even to monitor progress while execution. I hope you like this solution and Flow overall.